Discussion in '3rd Gen Tundras (2014+)' started by l3LUEFALCON, Apr 25, 2018. I've decided I want to get rock sliders that bolt on to the frame rather than running boards that well.. don't. I like the idea of not having any brackets or running boards hanging down. I actually removed my OEM boards because of this. Do any of yall have some suggestions of bolt on sliders that are good but not super duper expensive? I got the Demello rock crushers and I’m very happy with them. Give Demello a call and I’m pretty sure they can give you a little discount over the phone. That’s what a few of my buddies did. Grey Wolf, smslavin and Sunnier like this. I vote SDHQ. Not cheap but the best in my opinion, after a lot of research-- bolt to existing holes; no need to drill or weld. Demellos are cool because you can bolt on or weld. sdhq_offroad, Grey Wolf, dcsleeper408 and 3 others like this. I have All Pro and like 'em. Got 'em through a group buy here. There angled up slightly which makes 'em a little less obtrusive. I also like Pelyreybilt and they're a vendor on this site. Eclipsed & Floating, joonbug, Grey Wolf and 2 others like this. i just got some P&P sliders, they bolt on, will try and get to them this weekend. i painted them kind of a gun metal color. aRabidLunatic, sigkid, SuperSilverTundra and 5 others like this. 831Tun, ChadsPride, Matty4wd and 7 others like this. i had demellos on my FJ and i've got them on my tundra. he's a great guy, quality work. the caveat with them is that if you want them weight bearing as sliders, you will need to drill a few holes into the frame or weld them. if you just want to use them as steps, no need to drill anything. equin, JDL17CM4x4 and boardude like this. Definitely will be paying attention to this thread! Am in the early stages of deciding on sliders myself. Another one that I’ve found is Hefty Fab out of Colorado Springs, though on their site they claim to only fit on CM’s and Access Cabs. Grey Wolf and boardude like this. Im looking at White Knuckle sliders. 4x4_Angel and dcsleeper408 like this. 4x4_Angel and zcarpenter92 like this. I had a local off road shop fab mine up for $600. Everything I saw shipped was costing me no less than $800. Maybe that is an option for you to save a little dough. ChadsPride, sigkid, SuperSilverTundra and 6 others like this. They almost look like the white knuckle ones. Great for $600. You have underpics of how they bolt on? I actually "borrowed" the design from P&P engineering. Didn't want to worry about my sliders while offroad. So I had these suckers welded on. No under photos from underneath at the moment. But I can get some later if youre interested in the attachment points. Eclipsed & Floating, UTTundra, equin and 2 others like this. I actually "borrowed" the design from P&P engineering. Didn't want to worry about my sliders while offroad. So I had these suckers welded on. No under photos from underneath at the moment. But I can get some later if youre interested in the securment points. Thanks! Wish this local shop was in SoCal so I could get some haha. how do you like these as a step? doesthe angle make it hard at all? where are you in socal? demello is in riverside. I was thinking of going to them since they are local. Seem like good guys and SexyTacoma's truck looks pretty good that they did. Which style did you have from them again? jason is a great guy. highly recommend going over there. when i lived in SD, he did all the work on my FJ. 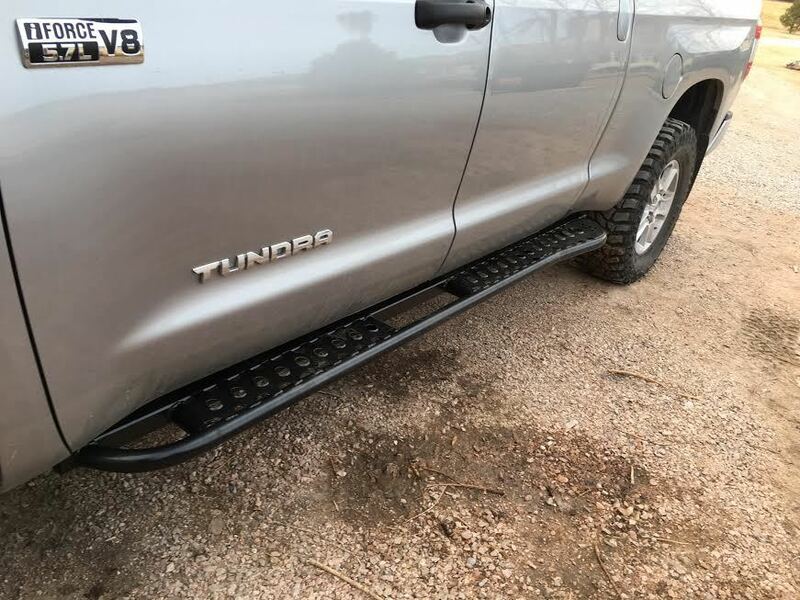 i have the hybrid sliders on the tundra. tundraoverland1 and dcsleeper408 like this. equin, Grey Wolf, 15whtrd and 1 other person like this. I'm waiting to hear back from HeftyFab. Not sure why they are stating their sliders are for 2007 and up..CM and "Access Cab Short bed"?? Say what?? I've been wanting to head down to their shop to check it out but I have to do it on a work day.. Closed on weekends. Yeah I thought that was interesting too. Especially cause one of the pics looks like their sliders on a DC. Wish fab shops were open till noon on Saturdays. Bet ya money that’s Scott Hunt’s, he was at the ToyTec CAD last year. 4x4_Angel and Grey Wolf like this. I'm thinking you are right. Cool! Just got an Email from "Chris" at Hefty. Access Cab is a mistake. Sliders for DC/CM 2007 and up. Would be nice if they could become an approved vendor here. I think they are on Tacoma World as a vendor. Or were..
Good! Then I can officially start considering them. Along with SDHQ, P&P, BAMF (if they’re in production when I want to purchase), or custom.